The Ardent has an almost continuous center line that makes it roll fast and the tread dramatically opens up toward the outside edges for better bite when the wheel is not quite upright. 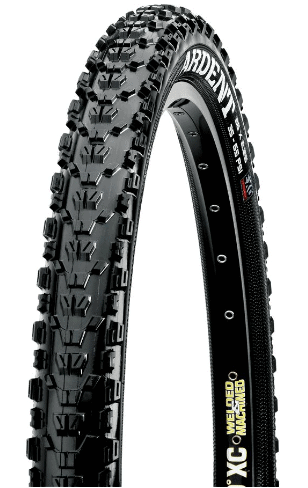 XC riders love this tire for its large volume and low rolling resistance. Many use it as a front tire for long distance events where float is valued over traction or as a rear tire when they want float and speed out back. Mounting a 29×2.4 Ardent on my rigid singlespeed a few years ago was a revelation. The tubeless-ready casing and dense EXO construction made tubeless application a breeze – no compressor necessary. I could feel the weight, all the extra rubber rotating around my axle, pulling outward to infinity and slowing down my bike wrangling skills for a moment, but the cush and grip was confidence-inspiring. I started charging and leaning the bike more, ripping around the hairpin turns a lot harder than I had previously thought possible. I was riding a tight, punchy trail with my relatively new Ardent when disaster struck. I was mashing up a steep little climb when a T-shaped stick went straight through the tread. I stopped immediately and had to pull of out – the thing was as big around as one of my fingers. No amount of tubeless sealant was going to save me, but I patched the tire with a standard tube patch and continued to ride it like that for months. I recently acquired a 29×2.25 tubeless EXO Ardent as a rear tire of rocky central Texas terrain. All of the exposed rock in the region has a reputation for shredding tires so Maxxis’ tires featuring EXO casing are popular here for their durability. As a rear tire, the Ardent leaves much to be desired for climbing loose gravel, as I have had it slip a few times. This might be remedied by lower pressure or better weight distribution while mashing the pedals, but a chunkier tire like a Maxxis Minion DHR couldn’t hurt. At present, this tire has enough grip for my riding style and is plenty tough for my terrain, so I will likely ride it until the lugs start to tear off, which could take a long, long time. I’m riding a Schwalbe Hans Dampf front tire because the wider-spaced lugs are confidence-inspiring for steering and holding a line when stuff gets loose. With all the exposed rock ledges in my region, Hans is showing signs of wear a little faster than I expected, as some of the side lugs are cracking and threatening to rip off. It would probably work better in softer conditions, rather than the cheese grater stuff I ride. Schwalbe tires are generally more expensive than a lot of brands, but they seem to have a magic durability-to-weight ratio, so they may be worth the expense. 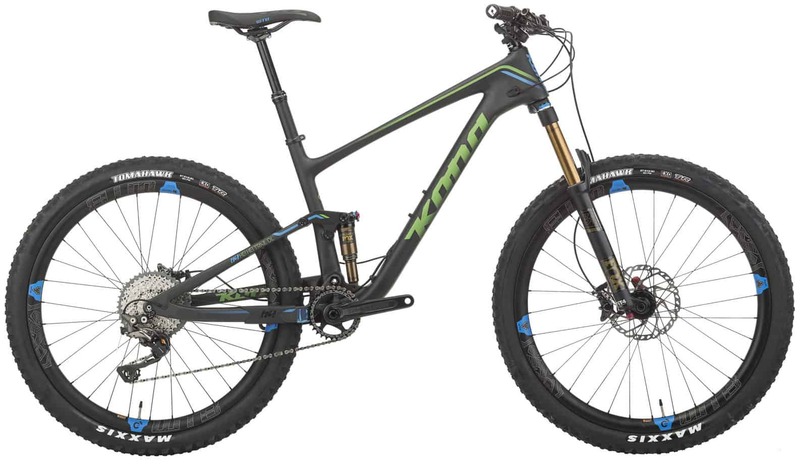 I spent a lot of time on a pair of 29×2.2 Maxxis Ikons, which are similar to the Ardent at first glance. The lugs are smaller and more tightly spaced, and the version I had featured thin, supple sidewalls. These were not a tubeless-specific model, but I was riding them without tubes and they worked very well. The Ikon is incredibly light for a mountain bike tire of that volume and I could feel the increased acceleration and agility. In the end, there was just not enough tread to grip in some conditions, and I feared that I would tear the relatively thin sidewalls, although many local riders swear by the Ikon as a go-to rear tire. I briefly rode a 29×2.2 Conti X-King “Protection” as a rear tire. It feels like it’s made from rhino hide and is about as inconsistent in texture. Mine developed a nasty wobble in the casing after a season of riding, giving me the unnerving feeling that I had a warped rim. I was not alone in this experience, as I discovered other riders who all had the same experience. Unlike most riders in my area, I got rid of that tire before the lugs started to rip off, leaving thread-y scars in their place. Continental might have improved their manufacturing and quality control since then, but it left a bad taste in my mouth. For riders looking for a tried-and-true design, the Ardent is a great choice. However, tire designs evolve and Maxxis seems to be replacing the Ardent with tires like the Forecaster, which features a more aggressive tread and a lighter, more supple casing. The Ardent will retain an association with good times and a well-behaved bike, regardless of what treads follow it.